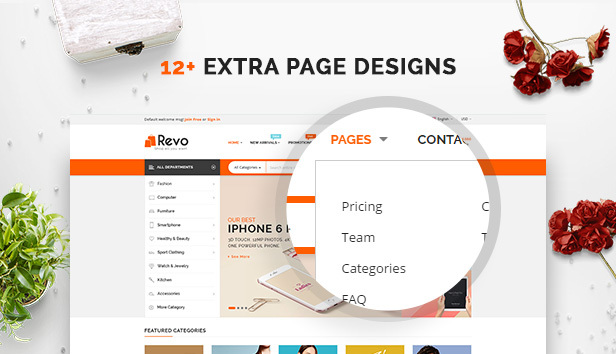 SM Revo is designed to be fully responsive, so your eCommerce theme will look amazing on all devices – perfect for shopping on the go! This theme includes 4 header and 4 footer styles for you choose from. You can select the header & footer style, which is suitable for your eCommerce store. This hi-tech store theme allows you to countdown to the end of sales or promotions in real time, or build anticipation for upcoming events! There are 12+ well-designed pages added to this theme. It enables you to build any online store website without limiting. With our Magento 2 Admin Panel, you will have full permissions to configure/update your online Magento store theme as you want without any coding experiences required. That’s not all about this awesome theme. There are many other cool features for you to explore. Let’s give it a try! We are sure that you will love it. Premium included extensions worth +$200: SM Basic Product, SM Mega Menu, SM Quickview, SM Image Slider, SM Listing Tabs, SM Search Box, SM Super Categories, SM Categories, SM Listing Deals, SM Listing Extend, SM Instagram Gallery, SM Shop By, SM Deal, SM Cart Pro.